Next: Dark Chocolate Cabernet Cookie Sandwiches with Cream Cheese Frosting! Want some? I sure do! 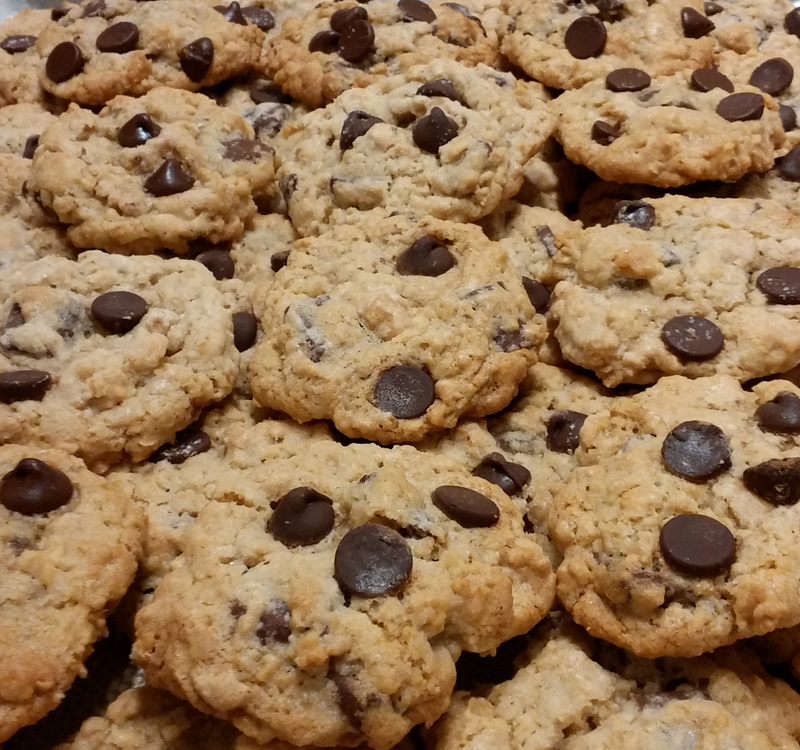 They’re oatmeal cookies that are soft on the inside; have a little crunch on the outside; loaded with chocolate chunks & peanut butter chips; and topped with chocolate chips & sea salt. I made these on a rainy day– one of my favorite rainy-day activities. Then, I brought them to a potluck the next day (and kept some at home too, of course). They were a hit! Let’s dive into baking, shall we? 1) Preheat you oven to 375 degrees F. Line baking sheets with parchment paper or silpat mats. Set them aside. 2) In a medium-sized bowl, whisk together the flour, baking soda, baking powder, salt, and oats. Set aside. 4) Add in the 2 eggs and vanilla extract. Beat on medium speed until fully combined, again using the spatula to scrape the sides down as needed. 5) With the mixer on a low speed, gradually mix in the flour mixture. Once the flour is mostly incorporated, add in the peanut butter chips and chocolate chunks. 6) Use a wooden spoon the make sure everything is mixed in. 7) Use a small cookies scoop (or two tablespoons) and scoop the dough out onto the cookies sheets leaving about an inch between each cookie. Press a few chocolate chips on the top of each cookie. Then sprinkle each one with sea salt. 8) Bake the cookies in the preheated oven for about 9 minutes, or until just starting to turn golden brown. 12) Serve right away or store them in an airtight container. They’ll be good for about a week. What’s better than a cookie, amiright? ?